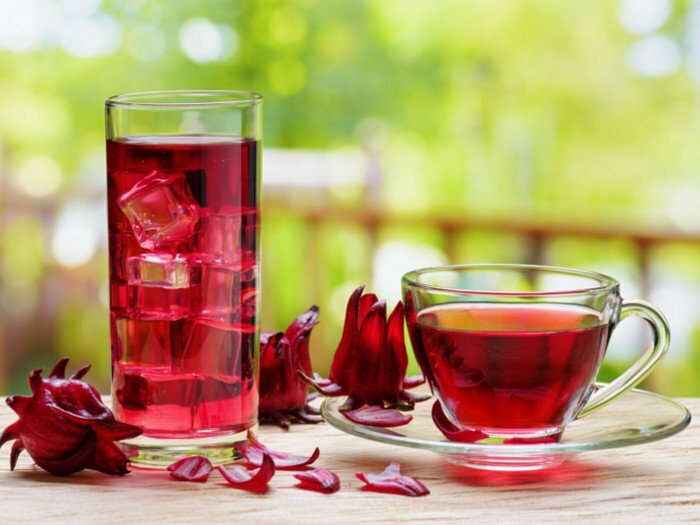 Below are two studies and a review addressing the antihypertensive effects of hibiscus tea. In this one, participants drank a cup of hibiscus tea three times a day. It lowered their systolic blood pressure (the first or top number of a blood pressure reading) by about 7 mm HG. If your BP was, say, 140/90 the tea might lower it to 133/90. (It didn’t significantly reduce the diastolic pressure. In vitro studies show Hibiscus sabdariffa L., an ingredient found in many herbal tea blends and other beverages, has antioxidant properties, and, in animal models, extracts of its calyces have demonstrated hypocholesterolemic and antihypertensive properties. Our objective in this study was to examine the antihypertensive effects of H. sabdariffa tisane (hibiscus tea) consumption in humans. A randomized, double-blind, placebo-controlled clinical trial was conducted in 65 pre- and mildly hypertensive adults, age 30-70 y, not taking blood pressure (BP)-lowering medications, with either 3 240-mL servings/d of brewed hibiscus tea or placebo beverage for 6 wk. A standardized method was used to measure BP at baseline and weekly intervals. At 6 wk, hibiscus tea lowered systolic BP (SBP) compared with placebo (-7.2 +/- 11.4 vs. -1.3 +/- 10.0 mm Hg; P = 0.030). Diastolic BP was also lower, although this change did not differ from placebo (-3.1 +/- 7.0 vs. -0.5 +/- 7.5 mm Hg; P = 0.160). The change in mean arterial pressure was of borderline significance compared with placebo (-4.5 +/- 7.7 vs. -0.8 +/- 7.4 mm Hg; P = 0.054). Participants with higher SBP at baseline showed a greater response to hibiscus treatment (r = -0.421 for SBP change; P = 0.010). No effects were observed with regard to age, gender, or dietary supplement use. These results suggest daily consumption of hibiscus tea, in an amount readily incorporated into the diet, lowers BP in pre- and mildly hypertensive adults and may prove an effective component of the dietary changes recommended for people with these conditions. Here they measured an 11.2% systolic reduction, from, say, 160 to 142 mm HG. That’s quite a reduction. They also measured a diastolic reduction. I read the study and couldn’t figure out how much tea they were drinking. I’ll assume it was at least once a day. Considering the high prevalence of hypertension, its debilitating end organ damage, and the side effects of chemical drugs used for its treatment, we conducted this experimental study to evaluate the effect of sour tea (Hibiscus sabdariffa) on essential hypertension. For this purpose, 31 and 23 patients with moderate essential hypertension were randomly assigned to an experimental and control group, respectively. Patients with secondary hypertension or those consuming more than two drugs were excluded from the study. Systolic and diastolic blood pressures were measured before and 15 days after the intervention. In the experimental group, 45% of the patients were male and 55% were female, and the mean age was 52.6±7.9 years. In the control group, 30% of the patients were male, 70% were female, and the mean age of the patients was 51.5±10.1 years. Statistical findings showed an 11.2% lowering of the systolic blood pressure and a 10.7% decrease of diastolic pressure in the experimental group 12 days after beginning the treatment, as compared with the first day. The difference between the systolic blood pressures of the two groups was significant, as was the difference of the diastolic pressures of the two groups. Three days after stopping the treatment, systolic blood pressure was elevated by 7.9%, and diastolic pressure was elevated by 5.6% in the experimental and control groups. This difference between the two groups was also significant. This study proves the public belief and the results of in vitro studies concerning the effects of sour tea on lowering high blood pressure. More extensive studies on this subject are needed. Hibiscus sabdariffa L. (Hs, roselle; Malvaceae) has been used traditionally as a food, in herbal drinks, in hot and cold beverages, as a flavouring agent in the food industry and as a herbal medicine. In vitro and in vivo studies as well as some clinical trials provide some evidence mostly for phytochemically poorly characterised Hs extracts. Extracts showed antibacterial, anti-oxidant, nephro- and hepato-protective, renal/diuretic effect, effects on lipid metabolism (anti-cholesterol), anti-diabetic and anti-hypertensive effects among others. This might be linked to strong antioxidant activities, inhibition of α-glucosidase and α-amylase, inhibition of angiotensin-converting enzymes (ACE), and direct vaso-relaxant effect or calcium channel modulation. Phenolic acids (esp. protocatechuic acid), organic acid (hydroxycitric acid and hibiscus acid) and anthocyanins (delphinidin-3-sambubioside and cyanidin-3-sambubioside) are likely to contribute to the reported effects. More well designed controlled clinical trials are needed which use phytochemically characterised preparations. Hs has an excellent safety and tolerability record. The tea has a diuretic effect and is also thought to act as an ACE inhibitor. But as the second study discussed, that may not be the only mechanism for blood pressure lowering. When participants stopped the tea, their blood pressure went back up. Therefore, considering the side effects of drugs, we suggest that all hypertensive patients (except those with progressive end organ damage with lifethreatening hypertension) undergo 4–6 months treatment with non-synthetic drugs, i.e. herbal medicines (such as sour tea), as the first stage in the ‘step by step’ treatment. Can you imagine that here in the US? This entry was posted in Uncategorized on November 23, 2018 by Bix. I forgot to say … That second study, the one that promoted using herbs before drugs, which I think is a good idea, notwithstanding poor regulation, was from Iran.